This Electic Violin was built in 1948 by Lynn Johanson for his brother Eric Johanson, who designed the electronics and pick-up method. It uses a standard magnetic phonograph cartridge that has the steel needle in contact with the underneath of the bridge creating a direct vibration pick-up rather than any soundbox and microphone. This was certainly the first violin made or used in Australia, so is an important piece for that reason. It was not made with any intentions of commercial production but was purely made by my father Lynn Johanson of Melbourne, Australia, for the personal use his brother, and my Uncle, Eric Johanson, who was at that time living and performing in Adelaide, Australia. My father was trained as a sporting goods manufacturer and aircraft fitter which is where he learned the basic skills used to create this timber instrument. The body is made from three pieces of a maple table leg glued together then shaped into this purely functional shape. Convention was thrown away not only with the shape but also the electronics (Eric was told it would not work until he mocked up a very rough version and tried it successfully). His brother Lynn then took the details of how it was wired to the phono pick-up and the measurements of a conventional violin of Eric's and unknown to Eric built this violin for his brother's birthday present. The shape was purely determined by the physical requirements of a violin without a sound box. 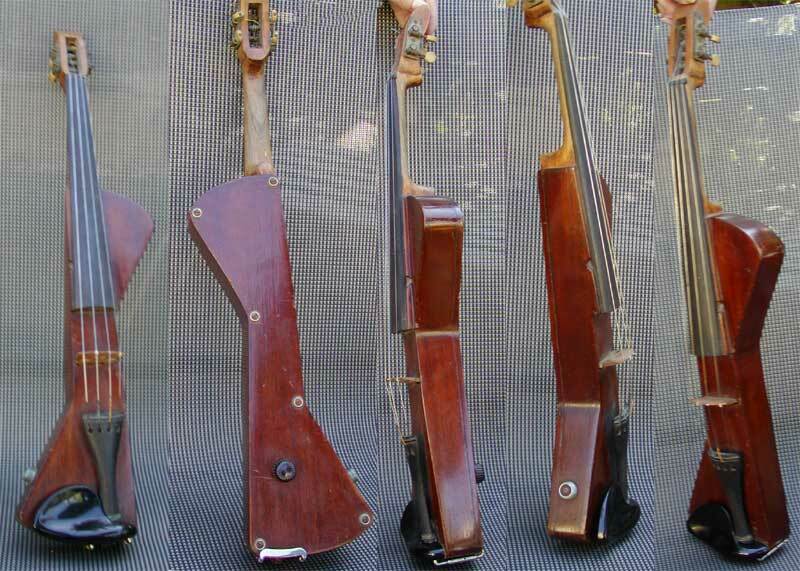 A chin/shoulder rest area was needed, an area to rest your hand near the base of the neck and a straight centre section to join those and mount the neck, bridge and base for the strings, were the required parts. All the rest of the conventional violin shape was discarded as unnecessary. This led to a logical but very radical shape instrument for the times that may have been the first violin to exhibit this shape, that has been used many times since on electric violins. The pick-up was built inside this version, rather than mounted externally on the rough test one for aesthetic reasons and protection of the needle mechanism. The strings were steel as that was Eric's preference and tension was adjusted by mandolin adjusters. The bridge was mounted on rubber blocks to allow it to vibrate freely, thereby transmiting those vibrations to the gramophone needle rather than the conventional sound box of a normal violin. It has a potentiometer mounted inside creating a volume control on the back that could be adjusted by the player without changing his position. Eric would simply plug the lead that screwed onto the **** terminal on the side of the violin into an amplifier or a studio sound system and play live performances and radio performances using this violin due to its tone being better than his conventional violins played in front of a conventional microphone. He played both swing and religious classical tunes using this electric violin. One of my favourite stories was that of one time he was in a radio studio, waiting to perform solo. Another band were performing and Eric was just playing around with their tune thinking no one else could hear him as his violin made very little noise unamplified. However, he was plugged into the radio station's system and the guy on the mixing board saw a sound input and turned it up. He liked what he heard and turned it up more, making it a dominant sound on the performance of the other band. Well, the station phones rang hot about how much they liked that swinging violin with the band - Eric was embarassed that his freestyle playing had been heard (he was always a very modest man) and the band were furious that their playing was overshadowed by another unrelated performer playing over the top of them! Eric Johanson the circuit designer and performer used this violin from 1948, through the 50s, performing on radio and in swing clubs, and the 60s and 70s occasionally performing at Seventh Day Adventist conferences after which both he and the electric violin retired. When amplified violin was required, out he'd pull this strange shaped instrument and surprise people at its ability to make sweet music. At other times he would use his conventional violin. I'm very proud to now own an incredible leap of violin design that my father and uncle are responsible for creating. For two very conservative gentlemen to create an instrument that was so advanced for the times and a radical shape that didn't seem to have reappeared till 20 years later, is something I am very proud of. Everyone told them it would not work but they ignored the knockers and "just built it". It has never been named as such, so I'd like to just call it the "Johanson Electric Violin". Colin Johanson (son, nephew and proud owner).